Adapted to feeding mainly on the ground, this woodpecker spends most of its time on a level surface, in a posture more-like that of a passerine, although its undulating (light is typical of a woodpecker (seep. 16). In flight a vivid color is revealed on the underside of the wings: this is yellow in eastern birds and red in western birds; also revealed is the white-rump. 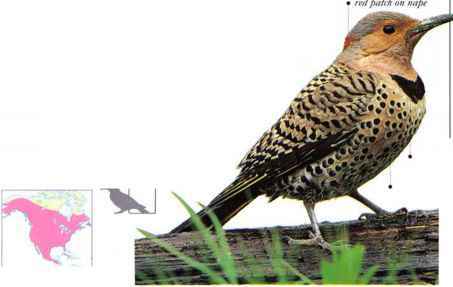 The Northern Flicker feeds mainly on ants, crouching and probing into the ground with its long, sticky tongue. The calls include loud, repeated "wick," or "wick-ker" notes. 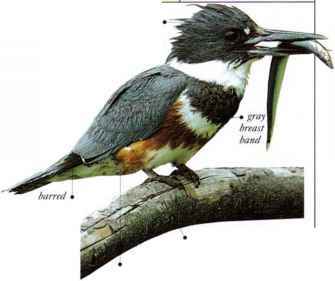 • Nest a cavity excavated in a dead tree or branch. • DISTRIBUTION North America, the West Indies, and Central America as far south as Nicaragua. Northern populations winter in the south of this range.